Other [i.e. not Torah] newspapers in our generation are pretty much all against G-d and His anointed and are full of dirty jokes, heresy, and atheism, unfortunately, and even on a weekday it is forbidden to read them. Even if someone only wants to read the news part brought in the newspapers, it's still forbidden, lest he continue to read the other bad parts ... [Someone who reads them] transgresses "Don't turn to the idols" and strengthens his yetzer hara against himself ... Many people stumble in this area because they don't impart to themselves the enormity of the prohibition; someone who cares about his soul should distance himself from them, because these newspapers have made many dead fall. Shmiras Shabbas KeHilchasah (second edition, ch. 21 note 117) quotes this source and doesn't bring a dissenting view. It was also asked about Reading a newspaper on Shabbat, but this is dealing with weekdays. It is logical that a person should know about the world about him. In some communities, fencing off the world is an ideal, and you would expect to find explicit teshuvot against reading of newspapers. But in other communities, this would not even rise to the level of a question, such that of course one may read the news. And it would then be implicit in their actions, such as in the actions of the Netziv. Lack of explicit teshuvot permitting is meaningless. QUESTION: Is it permitted to read the general news section of the newspaper on Shabbos [and Yom Tov]? The following is a free translation of guidelines given by Harav N. Karelitz(18) on this subject: "While a ben Torah and his family should avoid reading a newspaper on Shabbos altogether, we do not object to those who are lenient and read the permissible parts of the newspaper. This is especially true with regard to women, children and those who do not engage in the study of Torah [who require a kosher alternative so that they will not come to engage in idle or forbidden talk or worse]; we definitely should not object to their reading the permissible parts of the newspaper." One should consult his halachic authority for guidance as to how he should conduct himself in this matter. 14 See Magen Avraham 301:4 and Peri Megadim; Ya'avatz 1:162; Kalkeles Shabbos 33; Tehillah l'David 301:1; Da'as Torah 307:15. 17 See Da'as Torah 307:16, Shemiras Shabbos K'hilchasah 29:46. See also Igros Moshe O.C. 5:22-3 who writes that business newspapers should not be read. 18 Ayil Meshulash on Shitrei Hedyotos, pg. 79, 83 and 210, and in Menuchah Shleimah, 2. I thought you might be interested in this interview with R Moshe Tendler, the son-in-law of R Moshe Feinstein, where he says that, not only was RMF reading newspapers every day, but it was actually critical to giving him a view on societal factors which were important in him deciding halacha. Doesn't mean newspapers are good for all of us though - and Yiddish newspapers of the time are not today's newspapers. My shver was uniquely sensitive to society. 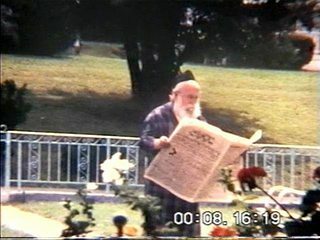 Despite what they write in all the books about him, my shver never failed to read the Yiddish newspaper – either the Tog in the early years or the Morgn-Zhurnal later on – cover-to-cover every single day. People publish that he would walk down the street and avert his eyes when he passed by newspaper stands. There are a thousand talmidim of his who will testify, “I bought the paper and handed it to him in the lunchroom in the yeshivah,” but it does not make a difference for some people – they do not want to hear that. Even when he was not well and the doctor insisted that he must lie down to sleep for an hour, he would go home, put on a bathrobe, and smuggle a newspaper into the bedroom so that his wife would not see it. He sat there reading the whole time, rather than sleeping. I used to ask him, “Why do you read this chazeray (junk)?” He would respond to me, “Dos iz mayn vinde” – this is my window [to the world]. He understood society and his piskei Halachah show that. He used to say, “People think that because I’m aware of society, I became a meikel (lenient decisor). What do they want me to do – paskn incorrectly? I’m not a meikel – I paskn the way it has to be. The Halachah takes into account societal factors.” This willingness to be exposed to society made his teshuvos more meaningful and more acceptable. When a student asked our Rabbi (R Tzvi Yehudah Ha-Cohain Kook) if he should read the newspaper, our Rabbi responded that he should not. The student said: "But isn’t this the Yeshiva of Klal Yisrael [the entirety of Israel] and we need to know what is happening in the Nation?" Our Rabbi responded: "When you are a Torah giant of Klal Yisrael then you can read the newspaper." R. Yisrael Meir Kagan writes very strongly against reading newspapers. He objects to them because they are responsible for hundreds of lost hours of Torah study, and they spread lashon hara, rechilus, and discord. Not the answer you're looking for? Browse other questions tagged halacha publications chol-weekday secular-culture . Why did a newspaper edit out, rather than obscure, women from a photo?